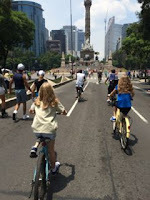 On Sunday mornings the entire length of Mexico City's Paseo de la Reforma is closed to cars. That's like closing off the Champs-Elysees, 5th Avenue or Oxford Street. From dawn til 2pm it's full of cyclists, rollerbladers, skateboarders, wheelchairs, Segways, scooters, buggies trailing dogs, joggers and every kind of non-gas-guzzling vehicle you could imagine. This morning I took A & N on their bikes from one end to the other and back again. What a joy it is to cycle several miles through the centre of the world's largest city, without having to worry about traffic.